Enjoy the speed of a Formula 1 racing car or the look of classics like the Mini Cooper or Volkswagen Beetle. Relish the diversity between the elegant sweeping lines of old times and the modern sleek designs. Collect cars and enjoy cars built for speed and for a leisurely Sunday outing. 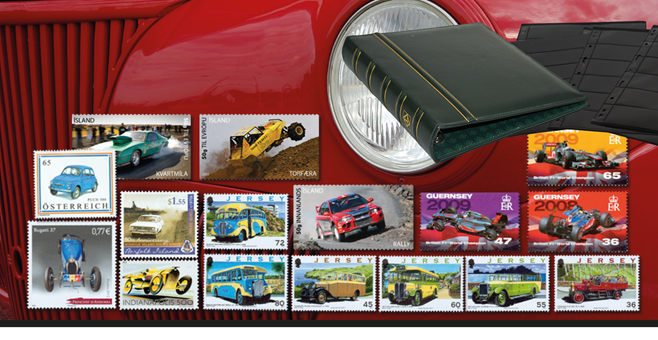 Approximately once a month you will receive hand selected stamps with cars for around 100 DKK. With the second shipment you will also receive a beautiful green Leuchtturm Classic leatherette album with stock cards. Special price for the album and two packets of sheets is only 125 DKK – an optimal setting for your thematic collection. All prices are exclusive shipping. You have 14 days right of return and collect only for as long, as you wish to.